Since Donald Trump's election, America's late-night show hosts have abandoned genuine comedy in favor of rabid, anti-Trump resistance. That's certainly their perogative. But if that's how they want it, they should be called out when they attempt to rewrite history as Stephen Colbert did Tuesday night. The Late Show host claimed that the now-nixed Iran deal was an "American promise," and a "treaty." It was obviously neither. It would be tempting to ignore Colbert's pathetic brand of "comedy" as the loony rants of an unhinged leftist who is slowly but surely watching the rationale for his show's political posturing evaporate. But unfortunately, many of his viewers buy into his fantasies. President Trump’s withdrawal from the Iran nuclear deal is the greatest boost for American and global security in decades. ... President Obama, and his trusty factotum John Kerry, made an agreement that guaranteed Iran would obtain a nuclear weapon. ... The JCPOA empowered the totalitarians. Trump’s exit squeezes them. ... Nations will be put to a choice: You can have access to the U.S. economy or you can have commerce with Iran — not both. Our European allies know this is not a real choice: They can’t isolate us, they need us, our markets, and the umbrella of our protection. ... 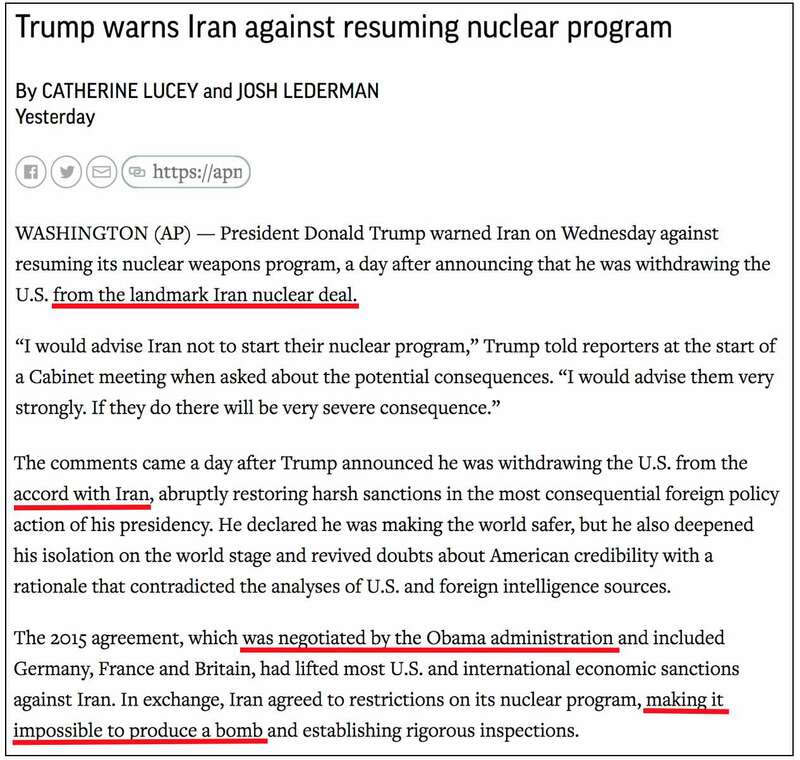 Moreover, the JCPOA did not represent America’s word, it represented Obama’s word. ... We give our word when we enter a treaty or enact legislation that cements commitments. Obama did not seek to make his deal a treaty precisely because he knew America was not giving its word. Remember how ridiculous it got when Iran's apologists insisted that "Death to America!" really doesn't mean "Death to America!"? STEPHEN COLBERT: You literally just backed out of an American promise. That's like saying, "I'm no longer denying my alcoholism. Let's drink to that. Nobody wants Iran to have nuclear weapons. That's what the treaty was supposed to stop. Pants on fire, Mr. Colbert.